On Friday, the indoor area of Trimper’s Rides was the site of celebration for the amusement park and the fourth- and fifth-generation family members that keep the rides operating. Governor Hogan, Comptroller Peter Franchot, Ocean City Mayor Rick Meehan and other dignitaries were in attendance, speaking about the impact that Trimper’s has had on Ocean City and the state of Maryland over the years and presenting the Trimper family with citations recognizing the fun that Trimper’s has brought families for now 125 years. 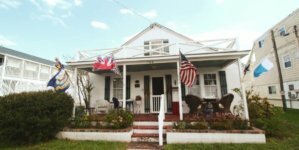 Her great grandparents had visited Ocean City several years prior to their move, Stephanie continued. When they went home to Baltimore, they ended their catering business and sold their bar. They opened up two hotels on the Boardwalk, The Eastern Shore and The Sea Bright, but Daniel Trimper wasn’t content just being a hotelier, Stephanie said. His passion was for entertainment and amusements. 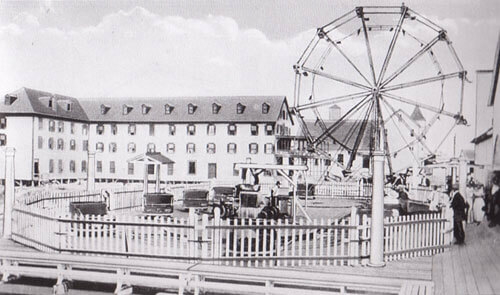 In the outdoor pavilion of the Sea Bright Hotel, the Trimpers began offering live theater, boxing matches, gambling, billiards, a bar, dancing, a shooting gallery, a roller rink, a live alligator exhibit, and the carousel that still goes round in the amusement park today. “I can only imagine how delighted he would be 125 years later to see how his vision has grown,” she said. A vintage look at a ferris wheel and adult fairy whip. Celebrating its 125th year, Trimper’s is verifiably the oldest operating family-owned amusement park in the United States, but many consider it the oldest family-owned park in the world. To some, Trimper’s ranks second to England’s Blackgang Chine, but according to amusement park historian Jim Futrell, Blackgang Chine wasn’t really an amusement park until after Trimper’s was established. An argument could certainly be made that Trimper’s is the oldest family-operated park in the world, and we like to think that it is, anyway. 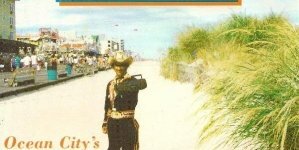 Here’s a quick look back at that oldest amusement park’s long and storied history here in Ocean City. Images courtesy of trimpersrides.com. 1890: Daniel and Margaret Trimper, great-great grandparents of the park’s current owners, first arrive in Ocean City. 1893: Just three years later, the Trimpers now own several properties on the Boardwalk spanning South Division and South First Streets. 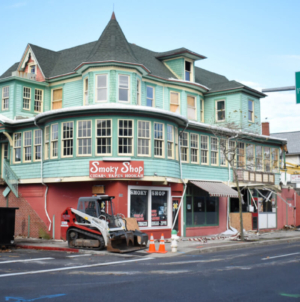 1900: One of their hotels, the Sea Bright, is destroyed by a storm. They rebuild, and model their new building after Great Britain’s Windsor Castle, calling it the Windsor Resort. It features a theater and an amusement park within its walls. 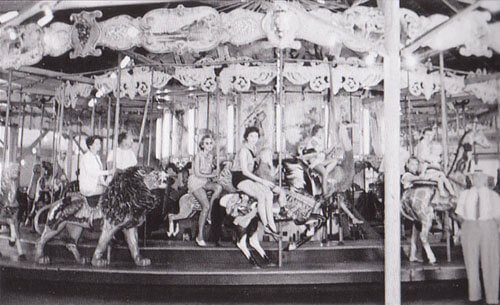 Flappers ride the carousel back in the ride’s early days. The merry-go-round’s forty-five animals, three chariots and one rocking chair were driven by a steam engine; rides originally cost just a nickel. One-hundred years later, the ride (now electrified) costs you four tickets, or $2.00 – unless you buy the discounted package of 40 tickets for eighteen dollars, and then your ride only costs $1.80. 1950s: The park expands to include outdoor rides. 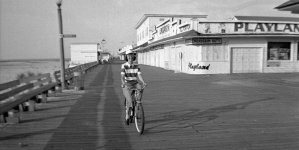 1983: The business expands even further, and The Inlet Village Shoppes at the very south end of the Boardwalk are built. Today the Inlet Village includes 14 retail shops and restaurants Harrison’s Harbor Watch and The Frog Bar. 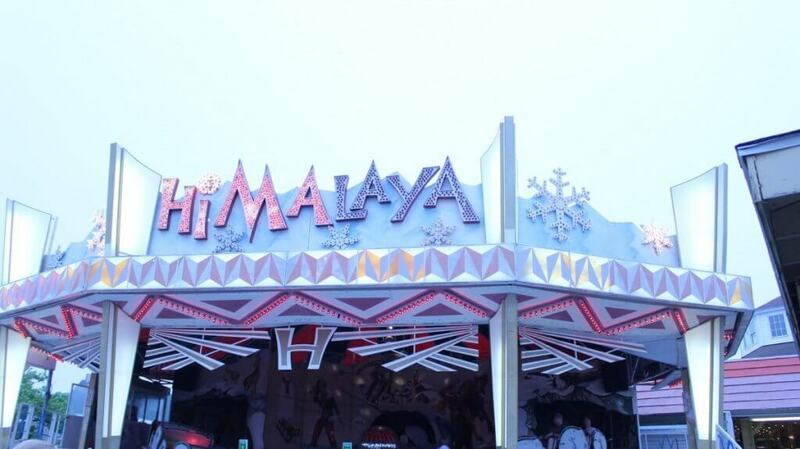 Many of the Trimper’s rides are fan favorites; the Himalaya, which first opened in 1976, is among them. There’s currently upwards of 40 rides on the premises, some indoors and some outdoors, some new and many others dating back to the early 20th century. Here’s a list of the rides that are operating at Trimper’s as of this article’s publication. The Herschell-Spillman Carousel, circa 1912: The carousel was made a historic landmark in 2007. 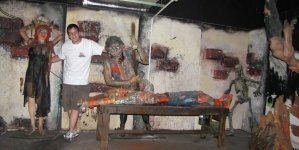 The Haunted House: This dark ride was built in 1964 by Bill Tracy. We’ve written a bit about this cult classic, which was said to be Granville Trimper’s favorite. Pirate’s Cove: A dark funhouse also built by Bill Tracy, this one in 1971. The Tidal Wave (1986): An Ocean City landmark, this looping roller coaster is a staple of the OC skyline and visible from well across the bay. Rest in peace, Aladdin’s Lamp! The indoor area of Trimper’s is filled with antique kiddie rides, many of them manufactured by famed amusement manufacturer William F. Mangels. Mangels’ creations include the 1920s era kiddie ferris wheel, the boats that sail on a track past a fishing village mural, and the Fairy Whip, whippin’ kids around the track since the ’20s. Other indoor rides include the smaller merry-go-round (1920s), the Flying Ace Airplanes, Big Dodgem and the smaller Kiddie Dodgem Bumper Cars, Fire Engines (1920s), Hampton I & II classic car rides and the Wild West Train. 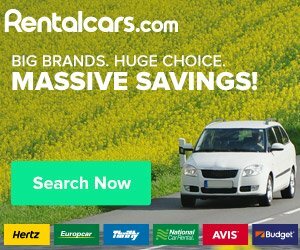 For those who might be interested in looking at a much more thorough and detailed history of Trimper’s Rides, I recommend this fantastic Images of America book.